Located in southwestern Oregon’s Siskiyou Mountain range, Oregon Caves National Monument and Preserve protects more than 4,500 acres of natural wilderness areas, including a solutional marble cave with 15,000 feet of passages. The namesake cave of Oregon Caves National Monument and Preserve was formed in parent rock that developed approximately 190 million years ago from the movement of tectonic plates underneath the Pacific Ocean, which pressurized limestone into marble and pushed it to a height of 4,000 feet above sea level. Groundwater eventually seeped into the marble, expanding small cracks into large, cavernous tunnels. Sediment dating within the cave dates its creation back between one and several million years ago. Today, the cave’s marble block measures approximately 1,080 feet long, 490 feet wide, and 390 feet high and contains more than 15,000 feet of natural tunnel passages. Human habitation of the Siskiyou Mountain region dates back at least 8,500 years to the days of nomadic hunter-gatherers within the Rogue River area, and by the time of the arrival of Europeans in North America, permanent indigenous villages had been established in the region for at least 1,500 years, though there is no indication that indigenous tribes used the marble cave. The region was first populated by European settlers following the discovery of gold by prospectors in 1851 and the formation of Jackson County the next year. 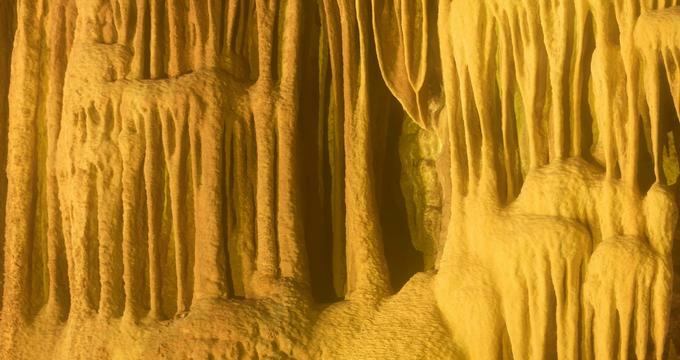 In 1874, the marble cave was discovered by area resident Elijah Davidson, and over the course of the next several decades, endeavors were undertaken to develop the cave as a private tourist attraction, resulting in damages to the site. Federal regulation of public lands in the 1890s led to the 1903 creation of the Siskiyou National Forest, and in 1909, Oregon Caves National Monument was established to ensure future protection of the cave and its surrounding natural region. The monument was put under the care of the United States Forest Service and opened for public ranger-led tours in 1910. The increasing popularity of automobile travel and paved highway systems throughout the mid-20th century led to increased tourism to the monument, which was put under the care of the National Park Service in 1933. In 2014, the monument was redesignated as a National Monument and Preserve and its land area was expanded by more than 4,000 acres of surrounding forest and wilderness that were formerly part of the Rogue River-Siskiyou National Forest. The cave’s creek was also renamed in honor of the mythological River Styx and added to the National Wild and Scenic Rivers System. Today, the Oregon Caves National Monument and Preserve is operated by the National Park Service and spans 4,554 acres in southwestern Josephine County within the Siskiyou Mountain range, near the border of Oregon and California. The marble cave is located approximately 20 miles east of the city of Cave Junction, accessible via Oregon Route 46 and United States Route 199. Along with caves in Kings Canyon and Great Basin National Parks, the cave is one of the few marble caves of the over 3,900 caves administered by National Park Service facilities. The park is comprised of areas of forest, subalpine meadow, mountain, and creek ecosystems, with elevations ranging between 3,680 and 5,480 feet within the the monument and reaching heights of up to 6,390 feet at the summit of Mount Elijah within the preserve area. Year-round climate is generally temperate, with average temperatures within the cave remaining at approximately seven degrees Celsius (44 degrees Fahrenheit) annually. The region is known for its high biodiversity, which includes more than 391 vascular plant species, along with trees such as Douglas and white fir, oak, and alder trees. Notable plants within the park include Big Tree, believed to be the widest Douglas fir specimen in the state. Animal species residing in the park include a wide variety of mammals, birds, reptiles, amphibians, and insects, including the at-risk northern spotted owl, Siskiyou gazelle beetle, Pacific fisher, and five protected types of bat species. Guided tours of the marble cave are offered between April and early November, embarking from the Illinois Valley Visitor Center. Cave tickets are available for advance purchase on the park’s website, with a limited number of first-come first-served tickets available at the park daily. Several tour packages are offered, including a 90-minute Discovery Cave Tour. Tour participants should be aware that navigation of steep and uneven stairs is included in cave exploration, and children under 42 inches tall must complete a test stair climb before being allowed within the cave. All participants are advised to wear warm clothing and secure walking shoes and must not bring clothing or equipment into caves that has previously been brought into other caves, in order to adhere to regulations regarding bat white noise syndrome. Other activities at the park include hiking trails and opportunities for photography and wildlife watching. Lodging within the park is provided at the Oregon Caves Chateau, a six-story historic hotel constructed in 1934 that offers 23 visitor rooms. A restaurant, coffee shop, and delicatessen are offered for park visitors within the hotel. Picnic table sites are also provided throughout the park, and a number of local restaurants are available in nearby Cave Junction. Camping is offered at the nearby USFS-maintained Cave Creek Campground, along with a number of private campground sites.